If you’re looking for modelling movies on TV, then you should probably live in Japan. However, there is a place where the film production on a model building is very good. It is the Internet and especially YouTube, where professional modelling channels are not an exception. See the first film not so much about the model, but about the modelling passion, in which the Fokker E.V from Arma Hobby model appeared. And not as a material to show the modelling techniques, but as the main character. Tom Grigat, a German modeller, is known for the production of films about modelling aircraft, mainly from the First World War. What distinguishes his productions from the huge number of YouTube channels devoted to modelling is the time-lapse montage. It consists of composing a film from individual frames, just like in animated movies. After each action taken with the model, its parts are carefully laid on the prepared background and photographed. The next pictures are then put into a movie sequence. It makes an interesting effect that is not available to classic YouTuber modellers. Parts of the model on Tom’s films are assembled and painted by themselves, and then the model moves to the start with a rotating propeller. The whole effort made by the author in the production of the film would have no significance if it were not for the quality of the models. The models assembled by Tom are masterful. Execution of details and painting draw attention with care and a high degree of realism. The film with the Arma Hobby Fokker E.V model as a protagonist is a very special production on the Tom Grigat’s YouTube channel. The model plays a role not so much of an object used for the show of assembly, but as the symbol of modeller’s effort. These long evening (and night) moments are well known to every modeller. The time when everything goes smoothly and those moments when a harsh word hangs over a dormant apartment. This endless series of activities, which are incomprehensible to regular people, lead to the transformation of a plastic toy from a monster into a more or less perfect replica of an aeroplane. 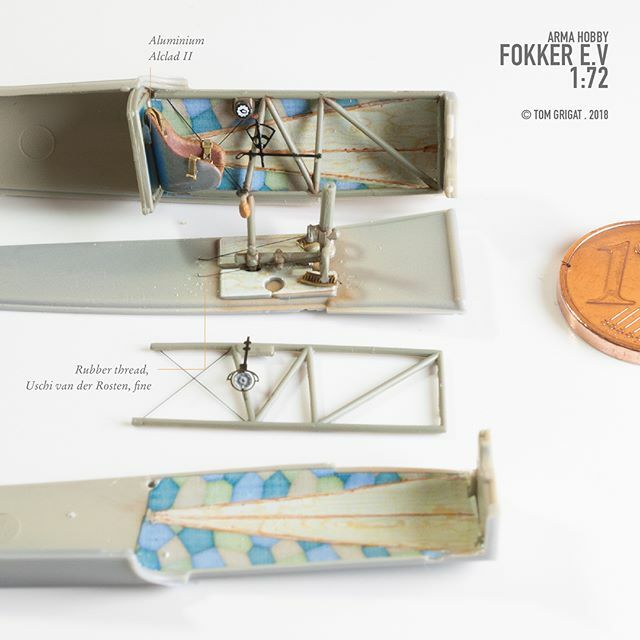 The casting of the Fokker E.V model in the main role in this exciting and inspiring production is a great honour for Arma Hobby. Thank you Tom Grigat for this very inspiring movie. We warmly invite readers to post comments. Write what’s the most reminiscent of your modelling successes and failures in this movie? «Attack Squadron – brand sold to new owner! I was sure the story was going to end with the EV big enough for the man to fly away in rather than his pet. Just did not expect such a clever creation! I was ready for another step-by-step assembly video but this is magic! Super, great film. Indeed, what a vision of the author. The hobby of modeling seen from a new perspective. Very clever and creative! Hope to see more of these films with different subjects being built. Well done! Very nice! Thank you Tom! Most interesting mix of several art forms to combine into one storyline. Modelling, puppetry, movie editing, musical arrangement make up a perfect recipe for such a great result! 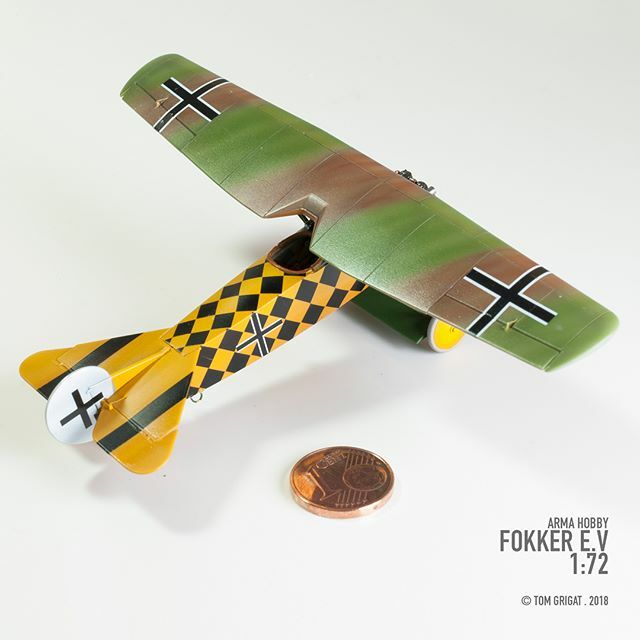 Choosing the Fokker E.V model was also a very wise decision as it is an ideal ‘monoplane’ for this creation. Nice video, and thank you for making 1/72 WWI subjects! Beaufiful video that totally reminds me on the very beginning (and even whole) of my modelling life (some 35 years ago). Models aren’t toys, they are pats and even friends, especially after much effort and time spent buiding it. I had no idea I could build my P.7a kits into loyal pets as well as model aircraft! I simply love Toms videos and I think he did a great job on Armas E.V. Keep up the good work! I really like everything fit so perfect. The colors were not so bright for this aircraft but still it was good. Would I t again. You bet your bottom dollar on that deal. Very clever imaginative. I thought modelling takes patience, but I can only begin to imagine the patience needed to do the animation for that movie clip. The little Fokker E.V is a gem. I made a similar comment on YouTube; the video reminds me of the ‘magic of Christmas’. The feeling of receiving a new, awaited kit, then spending hours; some fighting, some enjoying, building it. The ‘flight of fantasy’ at the end is certainly in my imagination; maybe many Other modellers too? It really is a very pleasant video; beautiful model at the end. The music complements it very well; I’ll check out Erick Miotke’s website ? ?. OK; I’m sold; time to buy a Fokker EV. Or two, or three! PS: Does the building character have a name? Interesting idea and completely different from the usual build video I was expecting. Looking forward to getting this kit and the P.11c. That should have been a Sopwith Pup! Enjoyed the video, but I wish more attention was focused on the kit itself. I plan on building the Fokker as the last rotary engine aircraft to fly in the USA.